This is an original glass slide that was sent to a movie theater in Green Bay, WI between 1916 & 1918 to show between films giving current news and events. 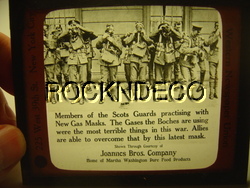 This glass slide's caption is "Members of the Scots Guards practising with New Gas Masks. 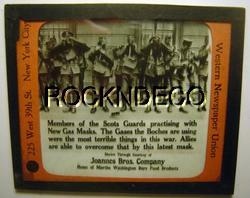 The Gases the Boches are using were the most terrible things in the war. Allies are able to overcome that by this latest mask." "Shown through courtesy of Joannes Bros. Company - Home of Martha Washington Pure Food Products". This glass slide was produced by the Western Newspaper Union of New York City. The slide measures 3-1/4" x 4". The glass slide is in good condition - there is some light dirt and a few small marks. A NICE PIECE OF WORLD WAR I / NEWS MEMORABILIA! Postage is $3.50. Each additional slide would be one more $1 to ship.